Delphin Technology AG: Saving energy is not just a priority for energy-intensive industries. Virtually any organisation is being forced to look at its energy efficiency. Furthermore, the DIN EN ISO 50001 standard (or the German SpaEfV legislation) makes the implementation of an energy management system inevitable in the long run. We therefore apply our many years of experience in industrial measurement technology to advise and support you on measuring energy efficiency in accordance with EN ISO 50001 using our hardware and software products. Our mobile energy measurement cases or stationary switch cabinet systems – both using Delphin hardware and software – identify and analyse potential energy savings and provide users directly with meaningful information. The tried and tested data logger from Delphin's Message series is at the core of data acquisition systems already being used for energy management. The data logger can be connected with a 3-phase power measuring unit to acquire any required energy unit such as electrical power, active power, idle power, power consumption and so on. 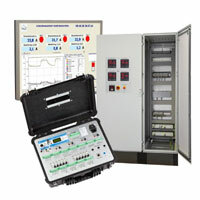 Measurement data processing and analysis then takes place independently within the data logger itself. The data is recorded to an internal memory and given a unique and manipulation-safe time and date stamp. Our ProfiSignal software enables users to generate individual visualization interfaces to give a clear overview of a system and to enable easy operation as well as system auditing. This enables compliance to DIN EN ISO 50001 and, for example, to the German legislation on energy efficiency (SpaEfV) and enables implementation of an energy management system in accordance with DIN EN ISO 50001. You get everything "from a single source" and benefit from our extensive range of services such as switch cabinet or mobile case construction, system installation, device calibration and cost-free telephone support. We will be pleased to help you and are looking forward to your call!